Today I had the privilege of photographing Teresa and her amazing family. 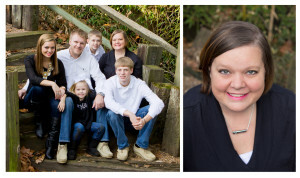 Teresa is the mother of 4 wonderful children, a wife, and a courageous fighter of leukemia. She is also an inspiration. In the midst of a challenge that would send many into darkness, Teresa is full of light, hope and love. Her children wanted photographs to remember her as she is today, before she goes bald. You see, hair loss is a side effect of a bone marrow transplant, and so Teresa is hopeful to be bald in the near future. Unfortunately, bone marrow matches are hard to find. Teresa was one of the lucky ones who had a match but her match recently found out he can’t donate because of complications. So the search is on again. YOU CAN HELP by registering as a blood marrow donor. Registration is EASY, PAINLESS, and FREE! All you have to do is swab your cheek! No needles, no visits to a doctor, just a swab and an envelope… you can do it! To get registered go to https://www.deletebloodcancer.org/. And please add Teresa and her family to your prayers. We’re praying for baldness, the first step to a full recovery. Update (5/23/13): I am super excited to report that a match was found for Teresa a few weeks after this was posted. She has now undergone the transplant and the latest test show she is cancer free! Praise be to God, and many thanks to the donor and all who registered themselves in the National Bone Marrow Registry! Update (9/12/13): After a hard and honorable fight, Teresa lost her battle with cancer. The angels are rejoicing in Heaven. Please pray for strength and peach for her amazing family.